John French Sloan, Self-portrait, 1890, oil on window shade, 14 x 11 7/8 inches, Delaware Art Museum, Gift of Helen Farr Sloan, 1970. John Sloan was a leading member of the Ashcan School. 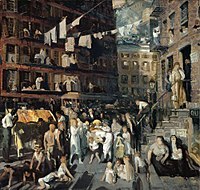 The Ashcan School, also called the Ash Can School, was an artistic movement in the United States during the early 20th century that is best known for works portraying scenes of daily life in New York, often in the city's poorer neighborhoods. The best known artists working in this style included Robert Henri (1865–1929), George Luks (1867–1933), William Glackens (1870–1938), John Sloan (1871–1951), and Everett Shinn (1876–1953). Some of them met studying together under the renowned realist Thomas Anshutz at the Pennsylvania Academy of the Fine Arts, others met in the newspaper offices of Philadelphia where they worked as illustrators. Theresa Bernstein, who studied at the Philadelphia School of Design for Women, was also a part of the Ash Can School. She was friends with many of its better-known members, including Sloan with whom she co-founded the Society of Independent Artists. 2 Connection to "The Eight"
The name "Ashcan school" is a tongue-in-cheek reference to other "schools of art". Its origin is in a complaint found in a publication called The Masses alleging that there were too many "pictures of ashcans and girls hitching up their skirts on Horatio Street." That particular reference was published in The Masses at a point at which the artists had already been working together for about 8 years. They were amused by the reference and the name stuck. (For examples of other "schools of art" see Category:Italian art movements e.g. Lucchese School and for instance School of Paris.) The Ashcan School of artists had also been known as "The Apostles of Ugliness". The term Ashcan School was originally applied in derision. The school is not so much known for innovations in technique but more for its subject matter. Common subjects were prostitutes and street urchins. The work of the Ashcan painters links them to such documentary photographers as Jacob Riis and Lewis W. Hine. 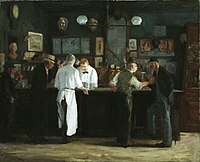 Several Ashcan School painters derived from the area of print publication at a time before photography replaced hand-drawn illustrations in newspapers. They were involved in journalistic pictorial reportage before concentrating their energies on painting. George Luks once proclaimed "I can paint with a shoestring dipped in pitch and lard." In the mid-1890s Robert Henri returned to Philadelphia from Paris very unimpressed by the work of the late Impressionists and with a determination to create a type of art that engaged with life. He attempted to imbue several other artists with this passion. The school has even been referred to as "the revolutionary black gang", a reference to the artists' dark palette. The group was subject to attacks in the press and one of their earliest exhibitions, in 1908 at New York's Macbeth Gallery, was a success. Many of the most famous Ashcan works were painted in the first decade of the century at the same time in which the realist fiction of Stephen Crane, Theodore Dreiser, and Frank Norris was finding its audience and the muckraking journalists were calling attention to slum conditions. The first known use of the term "ash can art" is credited to artist Art Young in 1916. The term by that time was applied to a large number of painters beyond the original "Philadelphia Five," including George Bellows, Glenn O. Coleman, Jerome Myers, Gifford Beal, Eugene Higgins, Carl Springchorn, and Edward Hopper. (Despite his inclusion in the group by some critics, Hopper rejected their focus and never embraced the label; his depictions of city streets were painted in a different spirit, "with not a single incidental ashcan in sight.") Photographers like Jacob Riis and Lewis Hine were also discussed as Ashcan artists. Like many art-historical terms, "Ashcan art" has sometimes been applied to so many different artists that its meaning has become diluted. The artists of the Ashcan School rebelled against both American Impressionism and academic realism, the two most respected and commercially successful styles in the US at the end of the 19th century and the beginning of the 20th century. In contrast to the highly polished work of artists like John Singer Sargent, William Merritt Chase, Kenyon Cox, Thomas Wilmer Dewing, and Abbott Thayer, Ashcan works were generally darker in tone and more roughly painted. Many captured the harsher moments of modern life, portraying street kids (e.g., Henri's Willie Gee and Bellows' Paddy Flannagan), prostitutes (e.g., Sloan's The Haymarket and Three A.M.), alcoholics (e.g., Luks' The Old Duchess), indecorous animals (e.g., Luks' Feeding the Pigs and Woman with Goose), subways (e.g., Shinn's Sixth Avenue Elevated After Midnight), crowded tenements (e.g., Bellows' Cliff Dwellers), washing hung out to dry (Shinn's The Laundress), boisterous theaters (e.g., Glackens' Hammerstein's Roof Garden and Shinn's London Hippodrome), bloodied boxers (e.g., Bellows' Both Members of the Club), and wrestlers on the mat (e.g., Luks' The Wrestlers). It was their frequent, although not exclusive, focus upon poverty and the gritty realities of urban life that prompted some critics and curators to consider them too unsettling for mainstream audiences and collections. 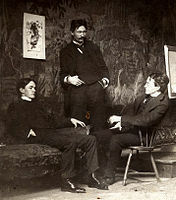 The advent of modernism in the United States spelled the end of the Ashcan school's provocative reputation. With the Armory Show of 1913 and the opening of more galleries in the 1910s promoting the work of Cubists, Fauves, and Expressionists, Henri and his circle began to appear tame to a younger generation. Their rebellion was over not long after it began. It was the fate of the Ashcan realists to be seen by many art lovers as too radical in 1910 and, by many more, as old-fashioned by 1920. 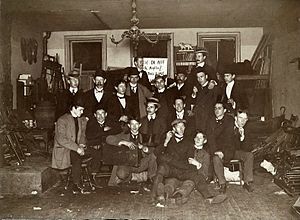 The Ashcan school is sometimes linked to the group known as "The Eight", though in fact only five members of that group (Henri, Sloan, Glackens, Luks, and Shinn) were Ashcan artists. The other three – Arthur B. Davies, Ernest Lawson, and Maurice Prendergast – painted in a very different style, and the exhibition that brought "The Eight" to national attention took place in 1908, several years after the beginning of the Ashcan style. However, the attention accorded the group's well-publicized exhibition at the Macbeth Galleries in New York 1908 was such that Ashcan art gained wider exposure and greater sales and critical attention than it had known before. The Macbeth Galleries exhibition was held to protest the restrictive exhibition policies of the powerful, conservative National Academy of Design and to broadcast the need for wider opportunities to display new art of a more diverse, adventurous quality than the Academy generally permitted. When the exhibition closed in New York, where it attracted considerable attention, it toured Chicago, Toledo, Cincinnati, Indianapolis, Pittsburgh, Bridgeport, and Newark in a traveling show organized by John Sloan. Reviews were mixed, but interest was high. ("Big Sensation at the Art Museum, Visitors Join Throng Museum and Join Hot Discussion," one Ohio newspaper noted.) As art historian Judith Zilczer summarized the venture, "In taking their art directly to the American public, The Eight demonstrated that cultural provincialism in the United States was less pervasive than contemporary and subsequent accounts of the period had inferred." Sales and exhibition opportunities for these painters increased significantly in the ensuing years. Thomas Pollock Anshutz, The Farmer and His Son at Harvesting, 1879. Five members of the Ashcan School studied with him, but went on to create quite different styles. Everett Shinn, Cross Streets of New York, 1899, Corcoran Gallery of Art, Washington, DC. George Bellows, Both Members of This Club, 1909, National Gallery of Art. Bellows was a close associate of the Ashcan school. 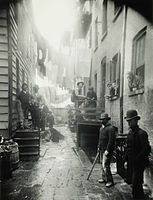 Jacob Riis, Bandit's Roost, 1888, (photo), considered the most crime-ridden, dangerous part of New York City. Arthur B. Davies, Elysian Fields, oil on canvas, The Phillips Collection Washington, DC. ^ Glen Jeansonne (9 June 1997). Women of the Far Right: The Mothers' Movement and World War II. University of Chicago Press. p. 4. ISBN 978-0-226-39589-0. ^ "Art From the Alleys". The Attic. Retrieved 19 March 2019. ^ Sam Hunter, Modern American Painting and Sculpture (New York: Dell, 1959), 28–40. 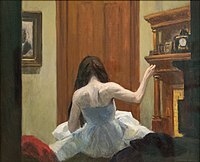 ^ Wells, Walter, Silent Theater: The Art of Edward Hopper (London/New York: Phaidon, 2007). ^ Loughery, p. 127, 134–140. ^ Judith Zilczer, "The Eight on Tour," American Art Journal, 16, no. 3 (Summer 1984), p. 38. Brooks, Van Wyck. John Sloan: A Painter's Life. New York: Dutton, 1955. Doezema, Marianne. 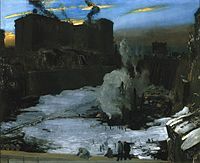 George Bellows and Urban America. New Haven: Yale University Press, 1992. Glackens, Ira. William Glackens and the Ashcan School: The Emergence of Realism in American Art. New York: Crown, 1957. Homer, William Innes. Robert Henri and His Circle. Ithaca: Cornell University Press, 1969. Hughes, Robert. American Visions: The Epic Story of Art in America. New York: Knopf, 1997. Kennedy, Elizabeth (ed.). The Eight and American Modernisms. Chicago: University of Chicago Press, 2009. Perlman, Bennard (ed. ), introduction by Mrs. John Sloan. 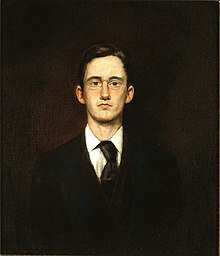 Revolutionaries of Realism: The Letters of John Sloan and Robert Henri. Princeton: Princeton University Press, 1997. Documenting the Gilded Age: New York City Exhibitions at the Turn of the 20th Century A New York Art Resources Consortium project. Exhibition catalogs, checklists, and photoarchive material. This page was last edited on 30 March 2019, at 20:43 (UTC).